Well, the Great American Pouf Tour is off to a wild and wooly start! I couldn’t be more excited about seeing these poufs travel the country and land in such fabulous spots. I’m going to be posting a little summary for each week of the pouf tour so I can share these amazing pouf tour photos and tell you a little bit about my relationship with each blogger. To clarify a bit, the pouf tour is a VIRTUAL tour. Sadly, I am not teaching how to make the poufs in each of the locations. I wish I were! I’m working on a physical tour schedule, which I’ll be sharing with you soon. But, you don’t need to be with me in person to learn how to make the pouf! 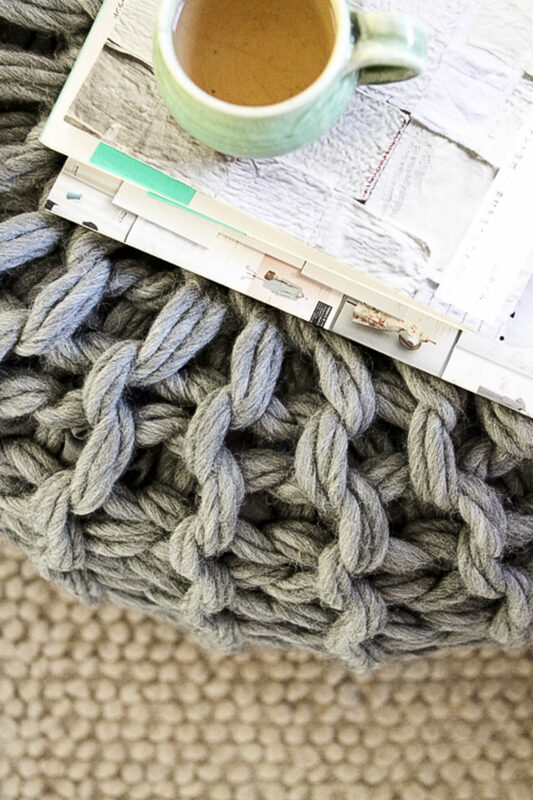 The pouf pattern is one of my favorite, easy patterns from my book Knitting Without Needles. By the way, I just opened a new shop! If you want an autographed copy, you can get one here, along with fun new kits and patterns. 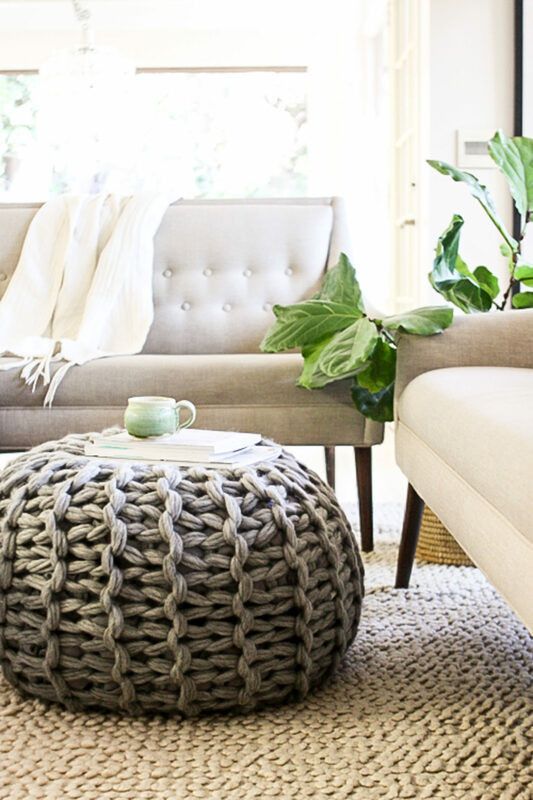 Above, is the Koala Gray Pouf I made for Design Mom. 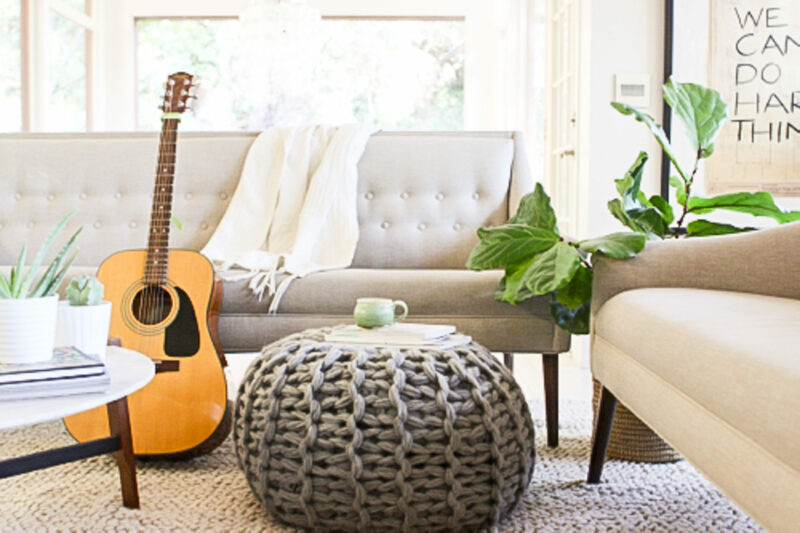 I love how she styled this in her gorgeous tree-house living room in Oakland, CA. Yes, I want to go live there. In her post, she not only shared the book, but also a free project from the book. Go check out her pouf tour stop! 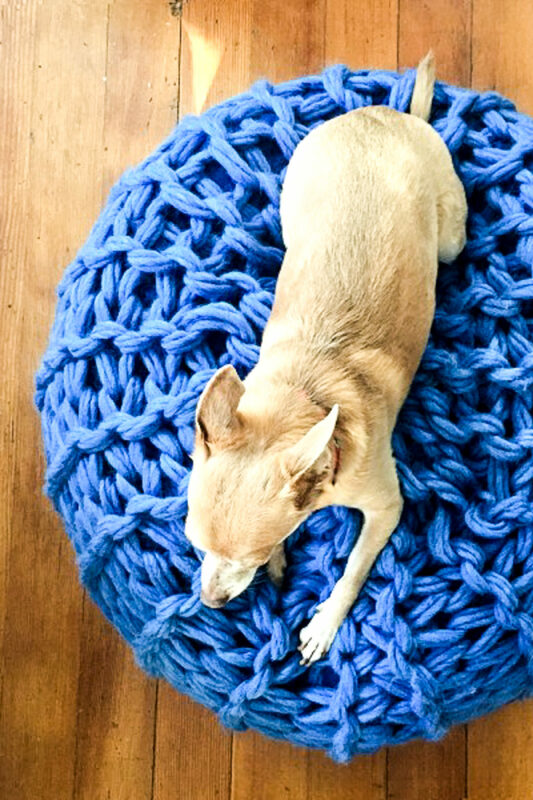 If you want everything you need to make this exact pouf, I’m selling kits in my shop. Do you want to hear how I first met Gabrielle Blair of Design Mom? I first started blogging back in 2011. After a couple of months, I finally got up the nerve to submit one of my projects to one of my favorite bloggers, Gabrielle, to ask if she would share my project. I didn’t expect anything. The next thing I knew, my page views jumped from 20 a day to 2,000! I nearly fell off my chair I was so excited. 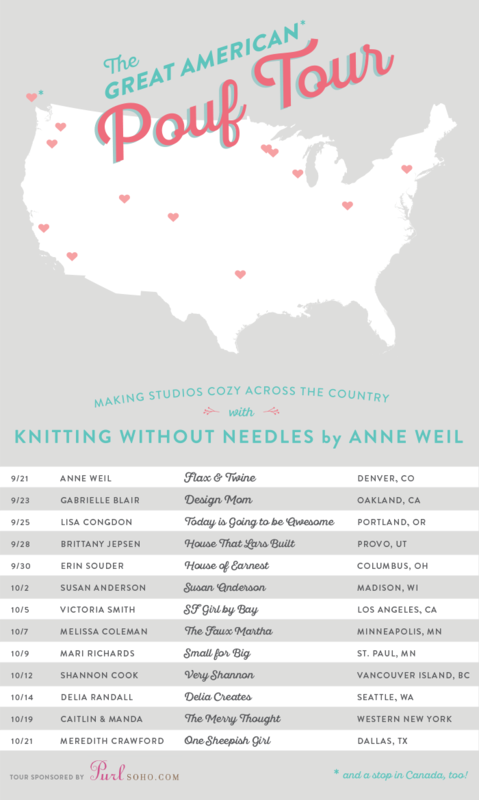 DesignMom was the VERY first person to share a Flax & Twine project way back when. She will always hold such a special place in my heart for that! That little page view juice kept me plowing ahead during my beginning days of blogging and made me realize, I can do this! Gabrielle was and still is an incredible inspiration of what is possible in the creative realm. She does so much for her blog, her business, for Alt, and for her family – I am in awe. Her book also hit the New York Times Best Seller list, go Gabrielle! 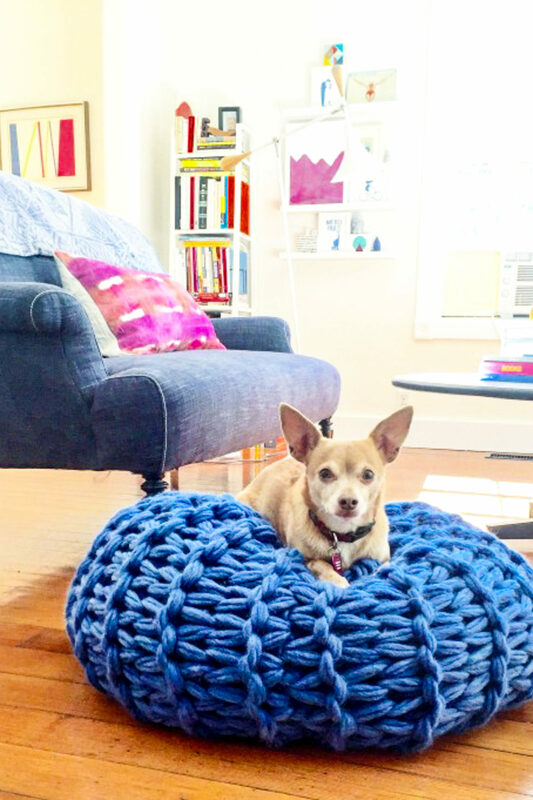 Next, I was tickled blue to see Wilfredo up on this pouf which now lives in Lisa Congdon’s house in Portland, OR. I feel so so lucky to have met Lisa. Three years ago, I taught at a retreat that Lisa was also teaching at. She gave me a long ride from San Francisco to Lake Tahoe. I know we both felt little trepidation about 4 hours in a small car with a total stranger, but we hit it off instantly. I’m not sure what it was, but we resonated in a beautiful way that entire weekend and still do. I love her dearly. She is absolutely an amazing person, a unique mix of honest, loving, thoughtful, vulnerable and true. Lisa is the kind of person that makes my chest glow to think of her. And, that’s all before I even consider her immense talent, which bowls me over regularly. You can get to know beautiful Lisa every day via her blog posts which are a true reflection of her as a person. Lisa interviewed me for her version of the Pouf Tour stop. If you want to learn a little more about me and how I got into finger and arm knitting and some details about the book process, go check out her post. There is lots and lots more pouf-y goodness to come. All these lovely folks will be sharing their poufs with us over the coming weeks. I’m giddy with anticipation, aren’t you? I’m so excited about these poufs. I just ordered your book, but want to make sure I have everything I need to start asap. How much yarn is required for the pouf above? Thanks for leaving a comment. I’m so glad you ordered my book! The pouf requires 480 yards, holding 4 strands that are 120 yards long each. Fantastic! Thank you so much! I can’t wait to start creating.